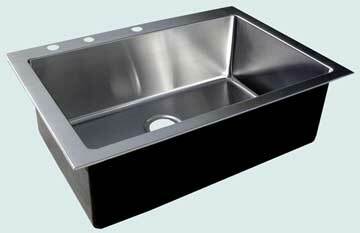 Custom stainless steel kitchen sinks from Handcrafted Metal are built to fit your space. 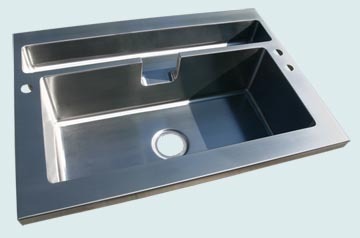 We use extra heavy duty 14 gauge stainless steel, which is 25% thicker than 16 gauge, and each sink is fully welded and polished. 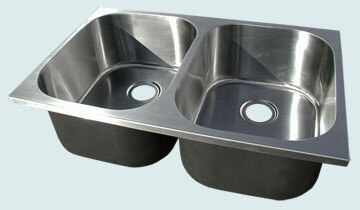 Our custom stainless steel kitchen sinks are extra heavy duty to last a lifetime. Every feature can be customized, including the number, shape, and size of the bowls, and rims for undermount, drop-in, and flush mounting. Choose from additional features, such as woven aprons, backsplashes, drain boards, and towel bars to further personalize your sink. 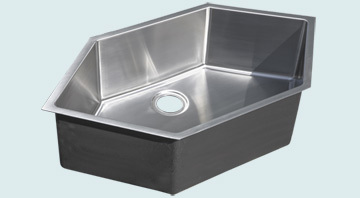 We can even build a custom stainless sink with specially radiused corners to exactly match the existing sink cutout in your granite, so you can update your old existing sink with a custom sink from Handcrafted Metal. 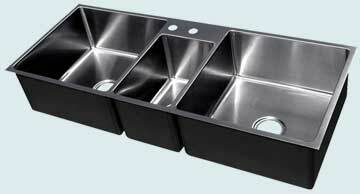 Click any sink on this page to customize the dimensions and get an instant price. Customize this sink to create the design that suits your kitchen. Shown here are two deep bowls that are equal in size. It has our Micrograin finish on 14 gauge stainless. When the drain is in the rear of the sink there is room in the cabinet below for soaps and supplies in front of the plumbing. Shown with our Micrograin finish on 14 gauge stainless. 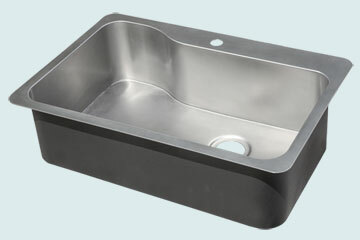 This large triple sink includes a veggie sink with faucet holes behind it. 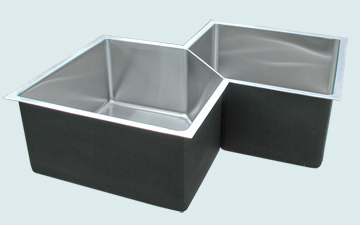 The right and left sinks are equal in size and depth. It has our Micrograin finish on 14 gauge stainless. 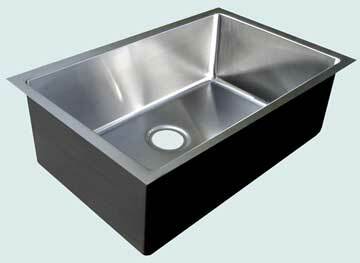 Designed to drop on top of any counter top, this lovely sink includes faucet holes on the rear deck. The drain hole is in the rear center position to allow more room for the plumbing in the cabinet below. It has our Micrograin finish on 14 gauge stainless. 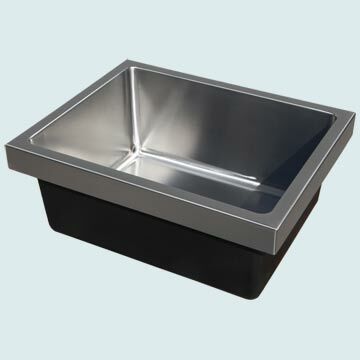 This compact stainless kitchen sink is designed to mount with the top flush with the counter tops. All corners are 3/4" radius for easy cleaning. 14 gauge stainless, micrograin finish. This sink features 2 large bowls that set in a corner cabinet. 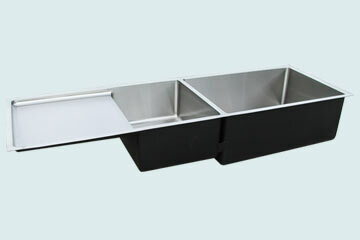 Each bowl has 5 sides, and the undermount flanges are covered by the stone counter top. Each bowl is 9 inches deep. It has our micrograin finish for a final shine. This sink is ten inches deep and is sloped at the bottom so the water drains to the hole in the back corner. 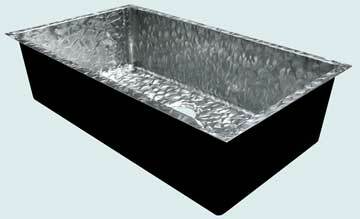 The sink walls meet the bottom with a tight 1/8" cove. It has our Micrograin finish on 14 gauge stainless. This delightful sink is a shiny gem in the kitchen. The butterfly pattern is excellent for hiding scratches in the stainless. The drain hole is custom placed in the rear-center position. It's made from 14 gauge stainless. 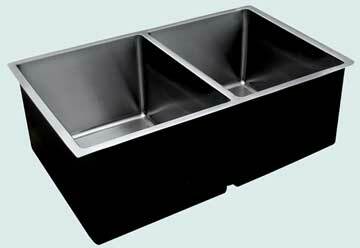 This double-bowl undermount sink features a lowered divider and centered drains. It's made entirely from 14 gauge #304 stainless and has our micrograin finish. 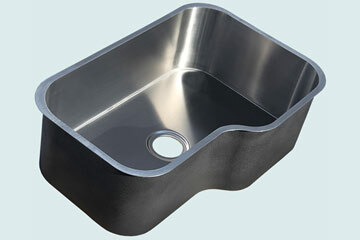 Replace your old undermount sink with a Handcrafted Metal custom radius replacement sink. Price includes Handcrafted Metal extracting dimensions, shape, and curves from a template that you provide. 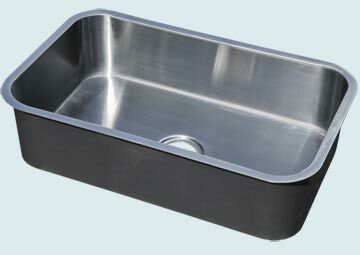 We build this heavy duty sink with 14 gauge 304 food service grade stainless. Micrograin finish. This sink replaces an existing sink. It has a custom shape that exactly follows the existing opening in the granite. 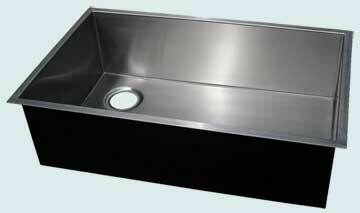 The sides of the sink are formed before the bottom of the sink is welded on. Price includes Handcrafted Metal extracting dimensions, shape, and curves from a template that you provide. Micrograin finish makes it shine. This super customized sink features custom curves and gently sloped walls. 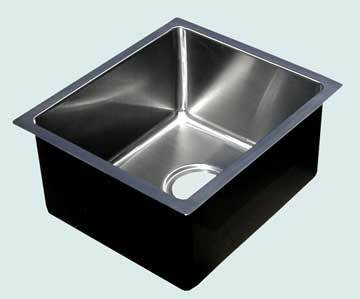 Our custom curved corners let you replace your old under mount sink without cutting granite. We built this custom 2-compartment sink to precisely match a template of the sink opening and fit under the counter top exactly like the old sink. Price includes Handcrafted Metal extracting dimensions, shape, and curves from a template that you provide. 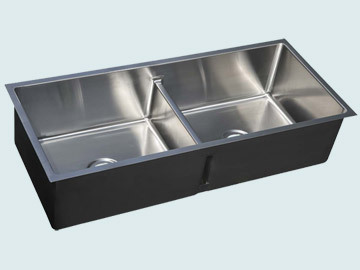 Our heavy duty stainless sinks are built to last with thick 304 alloy stainless steel. All welded 14 gauge stainless steel, micro grain finish.